Q: How do I Enter in the Infected By Art (IBA) competition? A: Entering the IBA Competition can't be easier, simply fill out the On-line form, agree to the Term and Conditions and upload your most incredible art. Once your Art has been posted on our website, you have entered the competition and the public can view your artwork. After the submission period has closed our jury will select the images that make it into IBA 5. Q: What's unique about Infected By Art? A: Infected By Art is the only Art Contest to offer On-line submissions AND Cash prizes, as well as Publication in our up-coming Art book. A: Anyone in the World. We believe that by having this contest take place on the Internet, much more Amazing art will be seen by everybody, and that is the goal of Infected By Art. A: The answer is both! We simply want the most incredible art in the world. Anyone is welcome to enter the contest, but no one, regardless of who they are, or what they have drawn, is guaranteed that the Jury or the Public will select their art. Q: What are the Cash Prizes? This award will be voted on only by those artists who submitted entries to IBA5. Each artist who submits at least 6 works of art qualifies. We will email every artist who has submitted work to IBA5 and ask them to select artist's work should receive this award and provide instructions on how to submit their votes. Oil / Acrylic / Watercolor: Gold, Silver, and Bronze awards. Digital / Photoshop: Gold, Silver, and Bronze awards. Pen / Ink / Pencil: Gold, Silver, and Bronze awards. Mixed Media / Sculpture: Gold, Silver, Bronze awards. Gold, Silver, and Bronze awards in each of the Categories will receive a full page in the IBA book dedicated to that image. Q: What are the Genre Categories for Submission? Q: What are the IBA guidelines for submitting published and copyrighted art works? A: Published artworks are eligible for entry into our competition. Artists must have permission from the appropriate copyright holder to submit these entries into our competition, so that they may be printed in our compilation art book if the image is selected to by our jury. False declaration with respect to any copyright information will result in the winning entry being stripped of any awards and prizes won for the competition. Q: What if I'm not sure which category my art goes in? A: There is really no right or wrong answers to this and sometimes art can overlap into several different categories. As an example, an image of Conan fighting some Robots could fall into the Fantasy Category or the Sci-fi category. The choice is clearly up to the artist, but you can only enter your art into one category. Q: Why are there entry fees? We are offering over $3,000 in Cash Prizes. The fee for each Image upload is the lowest of any contest that we know of, especially with our 5th and 10th images being absolutely free! The Cost of printing this High Quality book, Marketing it, and making it available throughout the Country is substantial. We offer large 1 or 2 images per page in the book. We do not want TINY images of your art tucked away with 4 or 5 other images on a single page. Each amazing Image in this book is a celebration of your talents and should be displayed as such. Q: Can I draw images of my favorite Super Heroes? Q: What is Fan Art? A. Fan Art is when someone draws their Interpretation of a Copyrighted Character or Images. Examples of Copyrighted Characters are images you see in Comics, Movies, Books, Magazines, etc. Just because you don't see the Copyright logo next to the image, it does NOT mean the image is not Copyrighted. Q: Can my Fan Art get published in IBA art book? A. No: Fan Art that does NOT have Copyright permission will be rejected for consideration into the final Compilation art book. Q: Who owns the Copyrights to the Image(s) I submit into the IBA contest? A: We never show your full size print ready artwork to the public. When you upload your entry we save 3 different sizes that are used various places on the IBA site. The fullsized file is only to be used by our judges for the judging at the end of the competition. 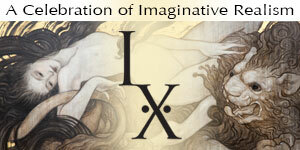 Q: Does everyone who submits Art Image into the Contest get into the IBA book? A: The simple answer is No. Our incredible Jury votes on their favorite Images. At the end of the contest we tally up those votes and the top images make it into the IBA book. We believe this Jury represents a diverse range of art professionals who have a deep understanding of the fantastic arts that the IBA is looking for. Q: Do you notify artists that they have NOT been accepted into the book? A: Yes, we will notify everyone via email whether or not your submission(s) were accepted for publication. We do not believe it is an acceptable process not to let you know if your Art has not been selected. Therefore you will receive an email confirmation letting you know whether your submission(s) were NOT accepted for publication at the conclusion of the contest. Q: If my art is juried into IBA5, will I receive a copy of the book when it ships? A: Artists who submit at least 4 paid entries into the competition and make it into the book will receive a free copy of IBA5 when it ships. Artists who reside outside the USA will have to pay shipping which will roughly be $52 US, and $39 US to Canada. The book weighs around 4 lbs. Q: How many Art Images can I submit? A: That is completely up to you, but the maximum is ten. You should submit your best Art, period! If that is one Image or ten, only you can decide what you feel represents your best work. You should also submit what you can afford: Please do NOT submit more than one image if you feel it will put you in debt. For this reason, IBA will not accept more than ten images by any one artist. Q: If I submit ten images, can all my entries make it into the IBA book? A: Technically, yes! 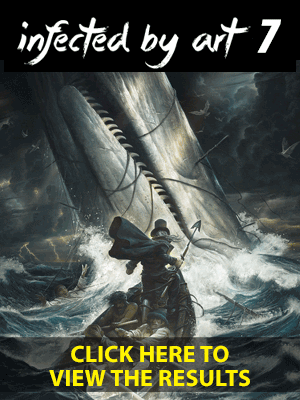 Simply put, we want the very best Sci-Fi, Horror, Fantasy or Illustrated Art available from all over the World. Your art, whether you are a Professional or an Emerging Artist, will be displayed together with everyone else's art, and have equal chances of making it into the IBA book. Q: Is there a minimum or maximum image size? A: There is no minimum or maximum image size, however, if your image(s) is selected to be a part of our book, we will need a hi-res image to print from. Therefore, when you upload your artwork to our competitions we will store an uncompressed copy of your file on a secure drive on our server that is not accessible by the public. It will only be accessed for jurying, or for printing. Once the jury has selected the artworks for the book we will also send out a request for an updated print ready file to be used for publication. Q: Do you critique my entries or tell me why my art did not make it into IBA? Q: Will you be selling copies of Infected By Art? A: Yes. Once we're at the stage where the book is delivered to the printer we will open up pre-orders for IBA5. Q: How do you decide on what goes on the cover? A: The Editors and Publisher of Infected by Art will select the image used for the cover after the jury has selected the artworks for the book. Q: Is Infected By Art affiliated with any other website? A: No, we are not affiliated in any other websites, however, we have developed relationship with certain companies in order to Co-Market our contest. Q: I'm an unpublished artist, will you publish a book of my work? A: Sorry, we are only doing Compilation Art books at this time. However, we are hopeful that by entering the IBA contest, your art will be seen by thousands of people from around the world and that you can find work in comics, magazine or books because of it. A: No. The voting is done On-Line by our Jury Panel. Q: When is the Contest submission closing Deadline date?